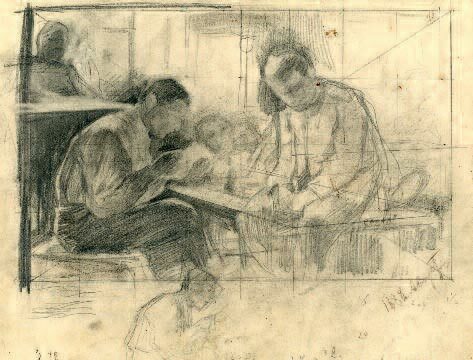 Tn 1881, Pasternak graduated from secondary school; he had been simultaneously taking classes at the Odessa School of Drawing. In 1881-1882, he attended the department of medicine at Moscow University, as well as studying painting and drawing at the workshop of Yevgraf Sorokin, a member of the Academy of Fine Art. In 1883 Pasternak transferred to the law department of the Novorossiysk (Odessa) university, which gave him a chance to go to Munich and study at the Royal Academy of Fine Arts for several semesters. 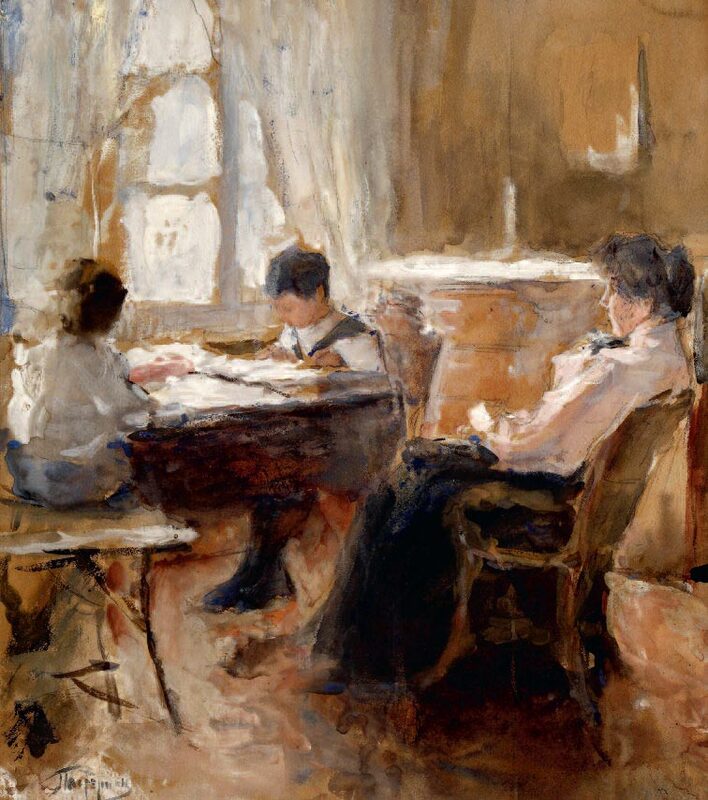 In his memoir, Leonid Pasternak writes lovingly about "dear old Munich", still untainted by tourism, with its museums, its Russian emigre circle, led by Valentina Serova, the mother of the Russian artist Valentin Serov. For Pasternak, meeting Valentina Serova there led to a friendship between the two families after they later settled in Moscow. Having graduated from the University, Leonid joined the army as a volunteer and served in the artillery in 1885-1886. As always, he sketched everything that caught his eye. One such sketch provided the subject for his first large-scale canvas, "Letter from Home" (1889). 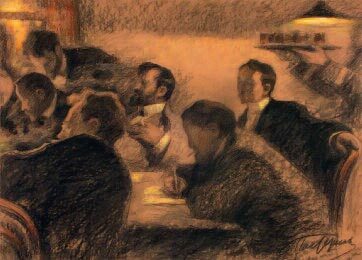 In 1889, Pasternak came to Moscow, rented a ro om in a hotel and began working on this painting. 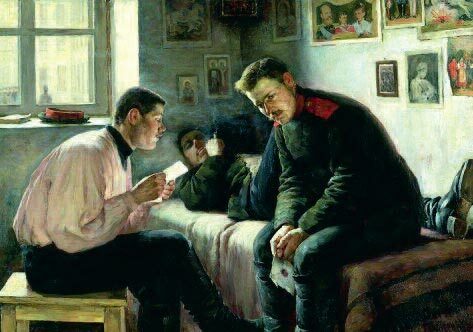 Rumours about a new artist from the provinces eventually reached Pavel Tretyakov. 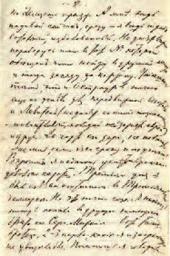 Tretyakov came to see Pasternak and bought "Letter from Home" for his collection "straight off the easel". The painting is now in the Tretyakov Gallery, among many other works by the artist. The artist painted this canvas for a forthcoming annual exhibition of the "Peredvizhniki" (Wanderers) group, and the success of "Letter from Home" contributed to Pasternak's reputation as one of the most notable artists of the time. Ilya Repin sent him students, Nikolai Ge called him his successor, and Vasily Polenov looked after his young colleague. 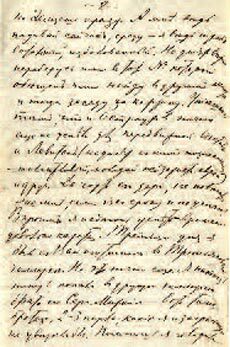 The story of Pasternak's work on " Letter from Home", a painting significant for both his career and the history of the Tretyakov Gallery, is illustrated here with this publication of selected letters which the artist wrote at that time to his fiancee, the pianist Rosalia Kaufmann. Rosalia remained in Odessa, and Pasternak, to fill the void of this unwelcome separation, wrote to her every day. These letters reflect the challenges of his work, his anxiety over the approaching exhibition, other artists' interest in the young painter, and his longing for his bride as he waited for her arrival. 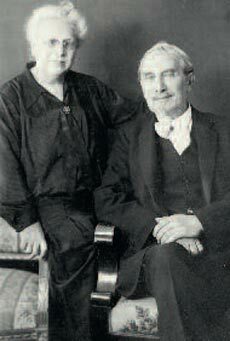 They were married in St. Petersburg immediately after the exhibition: the money Pasternak received from Pavel Tretyakov for "Letter from Home" paid for the wedding. 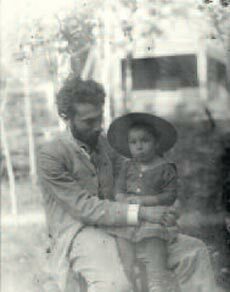 In 1890, Rosalia gave birth to their first son Boris, the future poet; three years later Alexander, who would go on to become a renowned architect, was born. 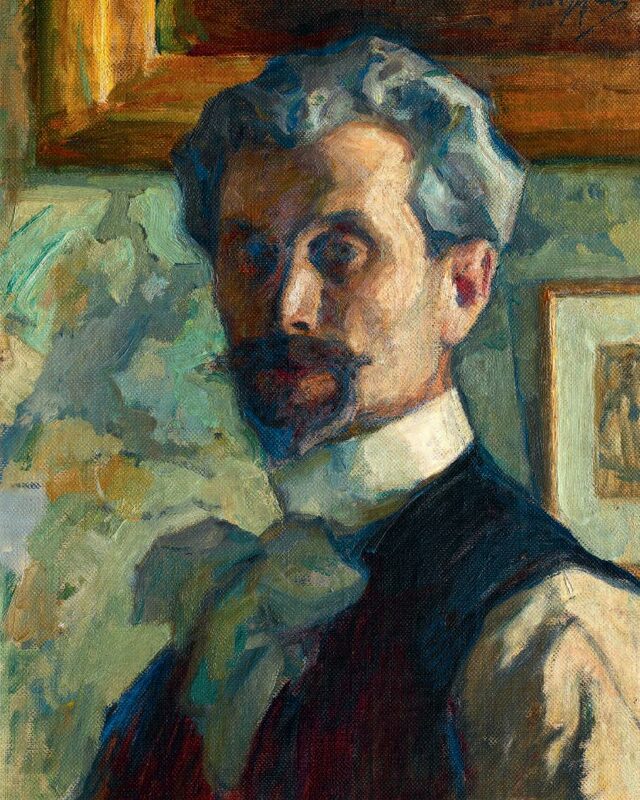 In his memoir, Leonid Pasternak points out that these years were especially significant for him — he met and became close to Leo Tolstoy in 1893, and started his teaching career at the Moscow School of Painting, Sculpture and Architecture in 1894. Besides teaching at the School of Painting, sketching everything he found interesting — at home and everywhere else — in his little albums, Pasternak devoted most of his time to painting portraits. 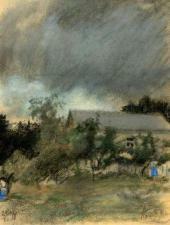 In addition to his ability to capture the very essence of the individual whose portrait he was painting, Pasternak had the gift — as became clear at the very beginning of his painting career — of capturing "in flight" the constantly changing nuances of his subjects' expressions; this swift impressionistic grasp of the inimitable moments of life was typical not only of his portraits, but of all his art, especially his drawings and sketches. Pasternak's works of that time are characterised by an easy fusion of lyricism and spontaneity; his visual impressions are always confirmed by his poetic view of the world. In 1898, Tatiana Tolstoy told Pasternak about her father's request that the artist illustrate Leo Tolstoy's new novel, "Resurrection". 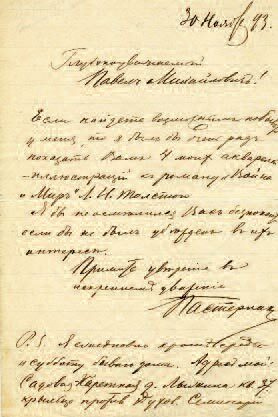 For Pasternak, an emerging artist who worshipped Tolstoy, this unprecedented offer of cooperation with the world-famous author became one of the "miracles" of his life. Tolstoy admired Pasternak's drawings as portraits — it seemed that the artist was able to guess what the novel's characters looked like, and achieved a resemblance to their real-life prototypes whom he had never met. This series of drawings, now housed at the Tolstoy Museum in Moscow, became a unique contribution to Russian life and culture of that time. In his "People and Situations", Boris Pasternak recalled his father's feverish work on the illustrations for "Resurrection": "I remember how pressed for time father was. /.../ There was the risk that the illustrations would be at variance with the corrections subsequently introduced into it. But my father's sketches came from the same source whence the author obtained his observations: the courtroom, the transit prison, the country, the railway. It was the reservoir of living details, the identical realistic presentation of ideas, that saved him from the danger of digressing from the spirit of the original." (Pasternak, Boris. "I Remember: Sketches for an Autobiography". Pantheon Books, 1959. Pp. 27-28). Pasternak's daughter Josephine was born in 1900; his second daughter, Lydia, was born two years later. The artist masterfully portrayed genre scenes that feel alive, and appear full of movement; he left a whole gallery of drawings featuring his children, works which convey the musical, warm atmosphere of his family life. Hinting at the success of Pasternak's drawings of his children, people jokingly said that his children "provided for their parents". In 1901 the Musee du Luxembourg in Paris commissioned five renowned artists, Pasternak among them, to paint scenes from Russian life. 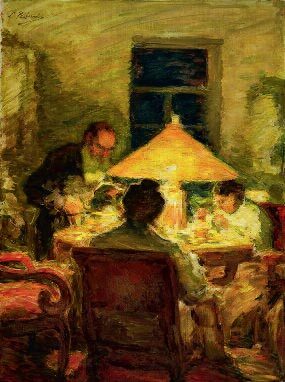 Pasternak painted his famous pastel "Tolstoy in his Family Circle", in the evening light. Grand Duke Georgy Mikhailovich of Russia decided to buy the painting for the Museum of Alexander III (now the St. Petersburg Russian Museum) after having seen it at the "Mir Iskusstva" (World of Art) exhibition. 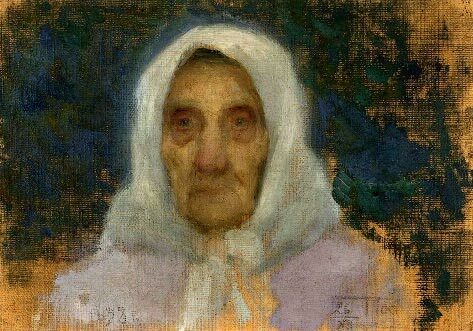 Leonid Pasternak took part in the first few "Mir Iskusstva" exhibitions and was a founder member of the Union of Russian Artists; the Union's yearly exhibitions (1903-1922) became the centre of the country's artistic life. In 1921 Leonid Pasternak departed for Berlin due to failing health. His wife and daughters went with him, while his sons stayed in Moscow. After the privations of the war and post-revolutionary years, Pasternak experienced a new rise in his creative energy In spite of far from favourable working conditions in the small, modest boarding house where he lived, he enthusiastically set to work and was soon comfortable in the new cultural atmosphere of 1920s Berlin. He painted portraits of many scientists, artists and writers of the time, among them the philologist Adolf von Harnack, the physicist Albert Einstein, the poet Rainer Maria Rilke, the writer Gerhart Hauptmann, the artists Lovis Corinth and Max Liebermann, to mention just a few of these world-famous Western cultural figures. 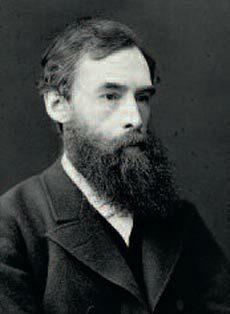 Among the Russians whom he knew and whose portraits he also painted were Alexei Remizov, Lev Shestov, Sergei Prokofiev, the diplomat Yakov Surits and his wife, Anatoly Lunacharsky, and Natalya Rozenel. His paintings of Berlin and the surroundings of Munich, as well as his still-lifes and indoor scenes, executed in soft evening light, are also of interest. In addition to participating in the "Secession" exhibitions, Pasternak showed his work in the gallery owned by Victor Hartberg, who organized two solo exhibitions of Pasternak's works in 1927 and 1931. The press and public were both enthusiastic about the Russian artist, and followed his work more and more closely. A large monograph by Leonid Pasternak, which included a long article by Max Osborn, the artist's recollections of Leo Tolstoy, as well as Pasternak's own autobiographical essays, was published in Berlin in 1932. This book is of particular value thanks to its use of excellent colour reproduction techniques and Pasternak's personal supervision of the quality of the reproductions. Most of the copies were destroyed in 1933, at the time when the Nazis publicly burned books — there was not enough time to rescue the monograph from the printing house. An exhibition of Pasternak's works in celebration of his 75th birthday — after which he was planning to send these works to Moscow — was also banned. At the end of the 1930s, the Nazi authorities began expelling Russians living in Germany in alphabetical order, by surname. 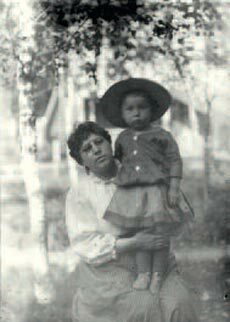 Pasternak decided not to wait till they reached the letter "P", and left for London, to visit his younger daughter there on the way home. 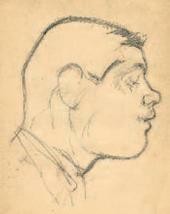 The Soviet Embassy in Berlin sent his paintings to London, to be later forwarded to Moscow. Pasternak was devastated by the sudden death of his wife in August 1939. A week after that, World War II broke out. 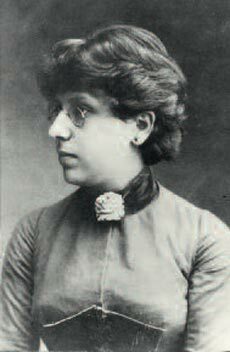 Heartbroken and suffering from angina, Leonid Pasternak lived through the war in his daughter's home in Oxford, where he died on May 31 1945. A large number of Leonid Pasternak's works are housed in museums and private collections in Russia (the Tretyakov Gallery the Russian Museum, Leo Tolstoy Museum, the Pushkin Museum of Fine Arts and many others in the Russian provinces). Some of his works are also in European and American museums, such as the Musee d'Orsay, Tate Gallery, the British Museum, the Ashmolean Museum in Oxford, and others. Pasternak's works in the private collection of his grandchildren residing in England are of special importance; his original notes and extensive correspondence are also kept there. Pasternak's daughter Josephine used these materials to publish "Zapisi raznykh let" (Notes from Different Years, Moscow, "Sovetsky Khudozhnik" (Soviet Artist), 1975), published in English as "The Memoirs of Leonid Pasternak", translated by Jennifer Bradshaw, Quartet Books, London, 1982. The Editorial Board express their sincere gratitude to Yelena Vladimirovna Pasternak and Pyotr Pasternak for their active and disinterested assistance in the preparation of this posthumuous article by Yevgeny Borisovich Pasternak. Our special thanks to the Pasternak Trust, and personally to Michael and Nicolas Pasternak-Slater for their contribution. I told you before about our place in society here. Here is an illustration of it: such a well-known artist as Polenov (he painted a huge canvas "Christ and the Woman Taken in Adultery" , which the state bought for 30,000 rubles; you may be able to see a small author's copy at the exhibition in Odessa5) expressed a wish to meet me, you see, and asked Ostroukhov to bring me over and introduce me to him! ... There is nothing new since yesterday yet, with the exception perhaps of the flattering invitation from the painter Polenov to have dinner with him on Thursday. Ostroukhov promises to be helpful with everything and introduce me to everyone. ... I am fortunate to be making more and more acquaintances among artists and others. People are very interested in me and seek my company. Made a few acquaintances among artists. Through Ostroukhov: Korovin, Nesterov — all are young and very gifted. They saw my painting (the soldiers) and liked it; everyone, including me, thinks that I can still finish it in time. Yesterday I had dinner at the Polenovs' and spent the entire night, till half-past one in the morning, in the company of some young artists and Polenov's delightful family. What a wonderful man Polenov is: simple, good-hearted, a European with a Russian heart! To say nothing of his great importance as an artist! What a delightful family he has, how peaceful his home is, how cosy and lavish the furnishings are. Yesterday I wrote to you, my darling Rosulya [nickname for Rosalia], about the unfortunate development with the contest.14 I hurry to cheer you up — Ostroukhov promised to arrange everything, so all is not lost yet. ... I was out today and met Surikov, the famous, larger-than-life Russian artist (the huge historical painting "Boyarynya Morozova" is by him); I dragged him to my place, and he saw my painting. He liked it a lot, gave me some advice, and said many insightful and interesting things. What a force he is, a Russian force! What power and originality! He inspired me so much that he had barely left when I grabbed my brushes and began working with the utmost abandon! With him to inspire me, I shall finish it in time, God willing. I was thrilled! I am, in fact, proud of his visit, for he seldom visits anyone, even the really "great" ones, and there is nothing that will tempt him to come out. What wouldn't I give to paint this picture well!! 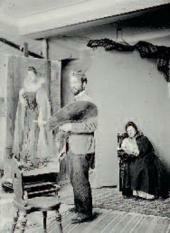 Surikov gazed at your portrait for a long while, but was too tactful to ask who it was. I feel so sorry for him! Poor man, his wife died quite recently! ... I was just starting this letter when a fellow artist, Ivanov,16 came to see me, and when he had looked at some of my drawings he suggested that I should do a few sketches for a new magazine just starting here in Moscow. I was terribly pleased! I will certainly do it — it means some income to pay for my lodgings — I can do two drawings in an evening — maybe 30 rubles or so. This is all I can tell you so far, but tomorrow I will know more and let you know. I do not know what will come of it, but something good may do. For now, I will say no more. ... I almost sent you a telegram just now, but then decided that it made no sense, since you would not learn anything from a telegram. I have news that is extremely important for me! /.../ Here it is: my painting is going to be finished; yes, yes, I will do it in time — rejoice, my sweetheart, my life, my darling! I have not the power to convey my joy to you! You are wondering what can have happened to me, have I gone mad? Oh no, no! I have just had word from Petersburg, from the artist Savitsky, a member of the "Peredvizhniki" [Wanderers] executive board, and I lay this news at your feet — the exhibition is opening on the 26th, not the 15th!19 And the closing date for submissions is given as the 15th, not 10-12 days from now, as I had thought! But please let me explain to you in detail (now that I have told you the gist of my news, so as not to "test your impatience") /.../ what I have been feeling recently, and what my state of mind has been, so that you can judge for yourself the effect that the fresh news from Petersburg has had on me. The thing is that this year's exhibition was to be opened on the 13th, and the paintings to be exhibited were to have arrived at the premises by February 1. I had already heard that back in Odessa, from the society's administrator Konstantinovich21, and later from my fellow artists here. As you know, at the time I was working strenuously; but I was afraid that I would not finish the painting in time, since I could not hope to do it when the closing date was so far away. I had often been told that the exhibitors should send their paintings in even earlier, but I would console myself with the thought that even if I were to send in my work on the 1st, it would still be accepted. I was working, and the time was flying by. I was still calm up till January. But then January descended upon me, literally descended upon me — the 1st, the 5th, the 10th — and I was not close to finishing yet! The more the days went by, the more desperate I became. I did not want to even think about the approaching deadline till today, till this minute — I just painted and hurried and bustled about, despaired, got distressed and almost went mad! There was only one consolation for me, and that was you and your imminent arrival; that was what I lived for and what gave me peace of mind — anticipating our happiness, so close now, the bliss of it, our marriage and departure from Moscow; in short, all those things that would make me forget about any painting, and would console me if it were to turn out impossible for me to appear before Russia this year (there, I've said it!) Well, you were the only beacon in that recent hellish mood of mine. So now, Rosulya, love of my life, I am at peace, because there is no question that I will be able to finish my painting, with almost a month left to do it, and the most important things are already in place; but what is to be done with your arrival and our wedding? That is the problem now, having got used to the thought of seeing you on the 6th, and with our invitations printed for the 7th... What is to happen? On the one hand, such joy, but misery, too! ... To begin with, my painting is getting a lot of interest from everyone, and praise, praise, praise! I cannot even believe it. I am even afraid; I have to admit that to you. Oh how I wish it that it could look the same at the exhibition, and that everyone would like it as much as they like it here, now! My darling little Rosulya, my dearest! I know for sure that Tretyakov is coming tomorrow! I am being advised to have the painting valued — what do you think? Some say it is worth more that 1,500, some — 2,000. Shaikevich says it is worth 3,000. 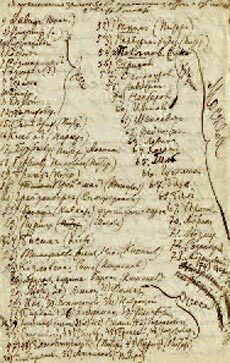 Some say His Majesty may buy it, others think it would be a pity, and it is better to sell it to Tretyakov for his gallery.26 As for me... I am indifferent for now. Could it be that everything people foretell for me will come true? If so, then — then — my head is spinning! The only thing that remains is for you to come soon! Make sure you come to me! May you bloom, my Rosulya! Pasternak came to Moscow in the autumn of 1888 and began working on his painting "Letter from Home". Pasternak chose a room at the "Kommercheskiye Nomera" (Rooms for Rent) in Lubyansky Proezd. 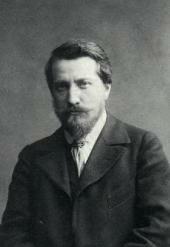 Ilya Ostroukhov (1858-1922), an artist, art critic, and collector. 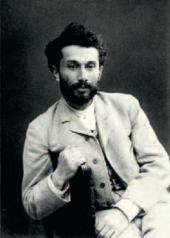 Pasternak met him in March 1888, at the "Peredvizhniki" (Wanderers) group exhibition in St. Petersburg. Sergei Tretyakov (1834-1892) was a collector of Western European art. His gallery was on Prechistensky Boulevard. 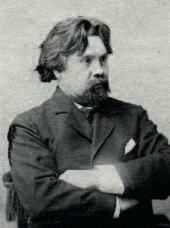 After his death, his collection, along with that of his brother Pavel (1832-1898) was donated to the city of Moscow. The above-mentioned works by Mariano Fortuny y Carbo, Pascal Adolphe Jean Dagnan-Bouveret and Mihaly Munkacsy are now housed at the Pushkin Museum of Fine Arts in Moscow. Odessa was one of the cities to which the "Peredvizhniki" (Wanderers) group brought its exhibitions. Pasternak had painted the first version of this canvas before he arrived in Moscow with the intent to paint it again, in a larger format. The original version has been preserved by the artist's family in Oxford. 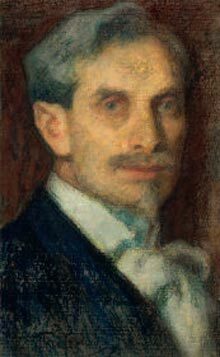 Carl Pasternak, Leonid Pasternak's cousin, started his career in commerce as a clerk and became a very successful entrepreneur; Leonid relied greatly on his support as he was settling in Moscow. Samuil Shaikevich (1842-1908), an attorney, amateur artist and collector. Valentin Serov came to Moscow in Autumn 1888. 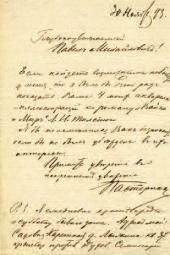 It is clear from the letter that Pasternak and Serov were already close. 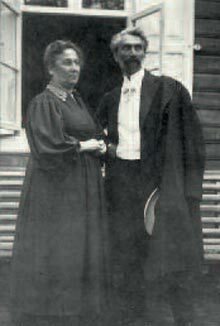 Serov's marriage to Olga Trubnikova was postponed until January 29 1889. In January 1889 the Mariinsky Theatre marked the 25th anniversary of the first performance of Alexander Serov's opera "Judith". 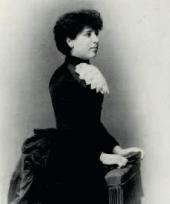 Serov's fiancee Olga Trubnikova was Rosalia Kaufmann's colleague at the Odessa Imperial School of Music. We know from the letter of November 14 1888 that the "unfortunate development" refers to the fact that Serov was informed that Pasternak's painting "The Ladies" ("Morning News"), which had been submitted to the 8th Exhibition, could not take part in the contest because it had been unveiled before the set time. The "old painting", the original study, was smaller: 90 x 41 cm compared to 110 x 152 cm. Sergei Ivanov (1864-1910) worked in the genre of history painting; he was later Pasternak's colleague at the School of Painting, where he was the head of the etching workshop. "Vsemirnaya Illustratziya" (World Illustration) was a popular illustrated magazine published in St. Petersburg by the Hoppe brothers. "January 15 1889, Petersburg. 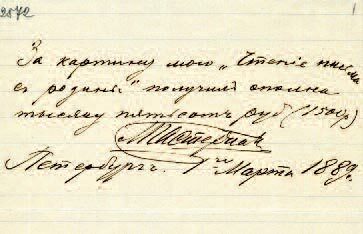 The 17th Exhibition of the "Peredvizhniki" [Wanderers] will open on the 26th at the residence of Mrs. Botkin in Sergievskaya (former premises of Women's Higher Courses.) Esteemed exhibitors, those wishing to submit their paintings to the ballot are requested to have them delivered to the premises no later than February 15. Paintings may be presented under a pseudonym. Member of the Board K. Savitsky." This refers to Leonid Pasternak's and Rosalia Kaufmann's wedding, which was planned for February 14 1889. 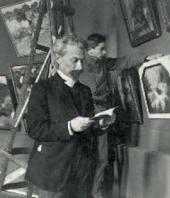 V Konstantinovich, Secretary to the Board of the Society of Travelling Art Exhibitions, accompanied the exhibitions to provincial towns. Pasternak attended the performance of "The Magic Flute" at the Mariinsky Theatre. Ivan Tsvetkov (1845-1917), a major Moscow art collector; like Shaikevich, he mostly collected drawings. "Thoughts" was painted in 1887 in Stepanovka, near Odessa. It is a portrait of a young lady in a garden. The painting was shown at the 16th exhibition of the "Peredvizhniki" (Wanderers) group (titled "Thoughts in the Garden"); its current location is unknown. The painting was sold to Pavel Tretyakov for 1,500 rubles. A Group of the Members of the Union of Russian Artists Author's variant of the picture of 1902 in the collection of the Russian Museum. Leonid Pasternak painting a portrait of Rosalia Rosenfeld. 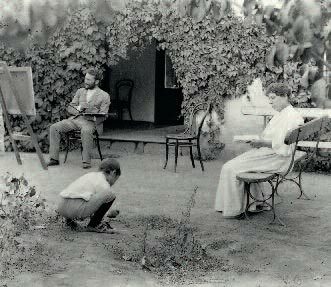 Leonid and Rosalia Pasternak with their son Boris. 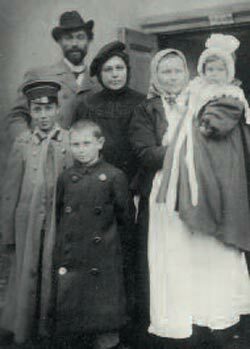 Leonid and Rosalia Pasternak with their children Boris, Alexander and Josephine, and their nanny Akulina Mikhalina at the doors of the annexe of the Moscow School of Painting, Sculpture and Architecture. 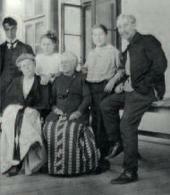 Boris, Rosalia Isidorovna, Lydia, Josephine and Leonid Osipovich Pasternak with Berta Samoilovna Kaufmann. 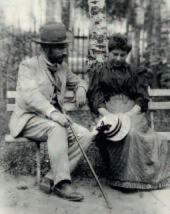 Leonid Pasternak with his sister Anna Freidenberg. Pastel on paper mounted on cardboard. 46.7 x 29.4 cm. 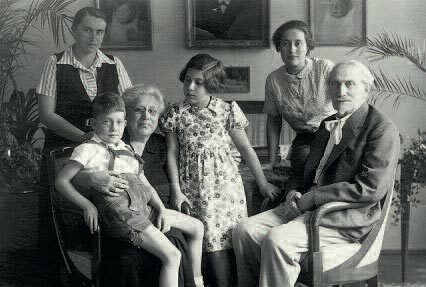 Leonid and Rosalia Pasternak with their daughter Josephine and grandchildren Charles and Helen.